Powerful diagramming libraries for more than 10 platforms. Impressive Diagrams. On Any Device. Experience the freedom to create one diagram and render it on 12 different platforms. Desktop, web or mobile - it's you who decide. Combine the comfort of using a familiar API with the excitement of programming for a new platform. MindFusion diagramming tools utilize a uniform API*, which makes your code easy to translate in another programming language. A broad range of samples covers the most important features of each tool and guarantees smooth transition among platforms. Each new version of our tools comes after careful research and open dialog with our customers. We listen carefully to their needs and enhance our components to meet best their demands. We not only leverage the best of the modern technologies - we are constantly alert for any new promising trends. This way we stay ahead of the future so you can stay ahead of the competition. 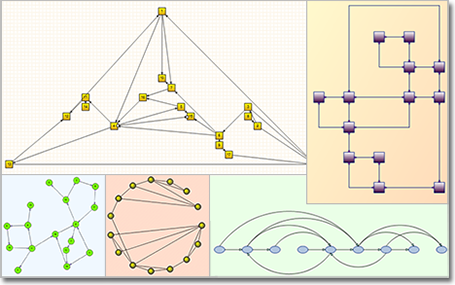 MindFusion diagramming pack ships with more than 15 automatic layout algorithms. Even diagrams with thousands of nodes get neatly organized with a call to a single method. You can further enhance the look and feel of your graph by turning on automatic link routing or applying some of the rich customization options provided with each layout algorithm. The extensive set of predefined node shapes, arrowheads and connector styles combined with a rich choice of pens and brushes guarantees that nothing stays in the way between you and your amazing diagram. If you are on the run, MindFusion has 40+ predefined themes that will give your flowchart in a second the polished look it requires. If you've designed a great chart, it's so easy to save its style and reapply it later. *Diagramming for ActiveX (FlowChartX) as the first diagramming tool developed by MindFusion uses a different API. From then on all diagramming components have been developed with a uniform API.
! The pack has no single installer. Clients get separate installation files for each of the tools. That's true for the trial version as well - you just download and install the trial version of the diagramming tools of interest to you.